Sparkling Rosé Sangria is the only cocktail you’ll want to drink all summer long. It’s light and refreshing, effervescent, and perfect for a crowd! My favorite Mondays end with a cocktail, but why can’t they also begin with one?? Oh yeah, because I have a toddler, and I’m pretty sure it would be considered negligent parenting if I were to consume alcoholic beverages prior to 9am. At least we can start with cocktails on Monday morning in blog land. Isn’t the Internet a wonderful place?? This Sparkling Rosé Sangria is everything I want to drink this summer. It’s light and refreshing. It’s ever-so-slightly sweet, effervescent and suuuper easy to drink, which is a must in the summertime. Slightly sweetened strawberry puree is mixed with a whole bottle of rosé, a little bit of vodka, plenty of freshly sliced strawberries and topped off with sparkling raspberry lime water. I wasn’t planning on adding vodka to the mix, but because the wine is essentially watered down from the strawberry mixture and sparkling water, I thought it needed a little extra kick. If you want to leave it out, the drink essentially turns in to a spritzer of sorts, which is equally delicious. It also allows you do unapologetically drink at least three or four and still carry on normal activities. Might I suggest pairing this perfect summer cocktail with these strawberry crostini, or Crispy Baked Potato Chips for the perfect happy hour bite. Sparkling Rosé Sangria is the only cocktail you'll want to drink all summer long. It's light and refreshing, effervescent, and perfect for a crowd! Add water, frozen strawberries and sugar to a medium saucepan. Bring to a boil and reduce to a simmer. Simmer 10 minutes and use a potato masher to smash the strawberries. Simmer another 5 minutes. Cool. Push mixture through a fine sieve, reserve the liquid and toss anything you couldn't get through the sieve. Add strawberry mixture, wine, vodka and sliced strawberries to a large pitcher. Let sit for at least one hour. Just before serving, add sparkling water and raspberries. Serve over ice. 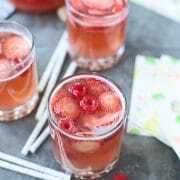 17 Responses to "Sparkling Rosé Sangria"
OMG! A sparkling rose sangria was SERIOUSLY on my list of things to make for the blog this summer. We are totally synched in the flavor department. This looks BEYOND amazing! Sounds amazing! How many cups of lime raspberry sparkling water did you use? I’m hoping to make this for July 4th! 20 ounces! Sorry about that! What brand sparkling water do you use? Can this be made one day in advanced or should it only sit for about an hour before serving? Have you made large batches for 30 people? I’ve doubled the recipe before, but haven’t quadrupled it, I imagine it would work just fine though! Could you use champagne instead of the sparkling water?